I know struggling with bulimia can be a “one minute up, one minute down” experience. I know because I’ve worked with hundreds of women, struggling just like you. I also know that you can recover, because my clients do. You may have tried many other programs, or like many, you may be self-managing and trying to keep the lid on things. 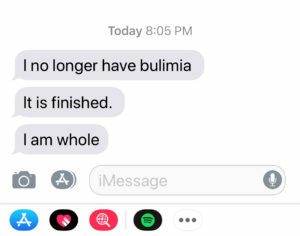 Some of my clients have shared, after years of using bulimia almost daily, no one has ever found out! Whatever your strategy has been, if you are ready, this can work for you. I’ve created this program so it’s convenient, available, easy to do, and represents real success for others. It can for you too. My most recent client texted this text message, she was finished, done, the old patterns completely gone! 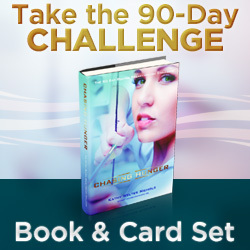 Together you and I assess where you are, what you want, then we plan this as we work our way through all aspects of this vital Mindset Program: Health & Relationships, Body Image, Self Acceptance, Forgiveness, & Living from Gratitude, healing relationships, utilizing this high-performance coaching model that is 100% focused on helping you achieve this outcome! 4. Find better ways to secure your dreams and implement those changes now. • You can Work from home, when travelling, or even at night – we agree with our times and we work then.